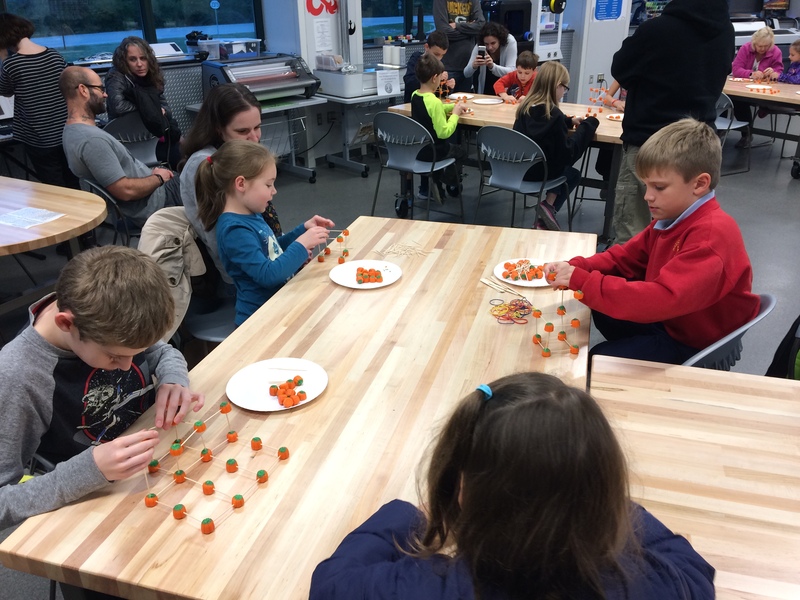 STEM programming and Halloween just sort of naturally go together. But I was looking for a slightly “less gross” way to connect the two. 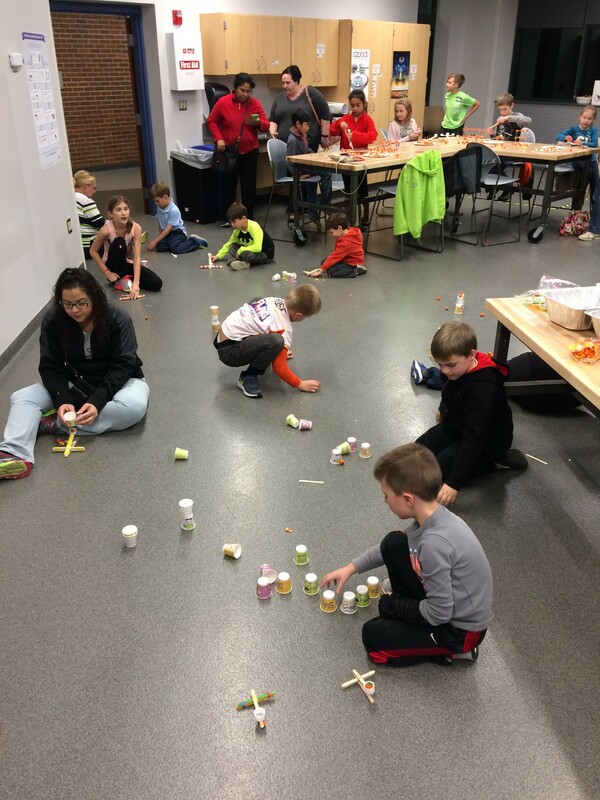 Building and pumpkins don’t seem to normally go in the same sentence, but we tried and it and had a blast! No poking yourself or anyone else with toothpicks. Be careful not to bump the table so as to not ruin your own or anyone else’s building. Created buildings must be at least two levels high: the base or table-top level and at least one additional level. You may each eat one candy pumpkin for inspiration. 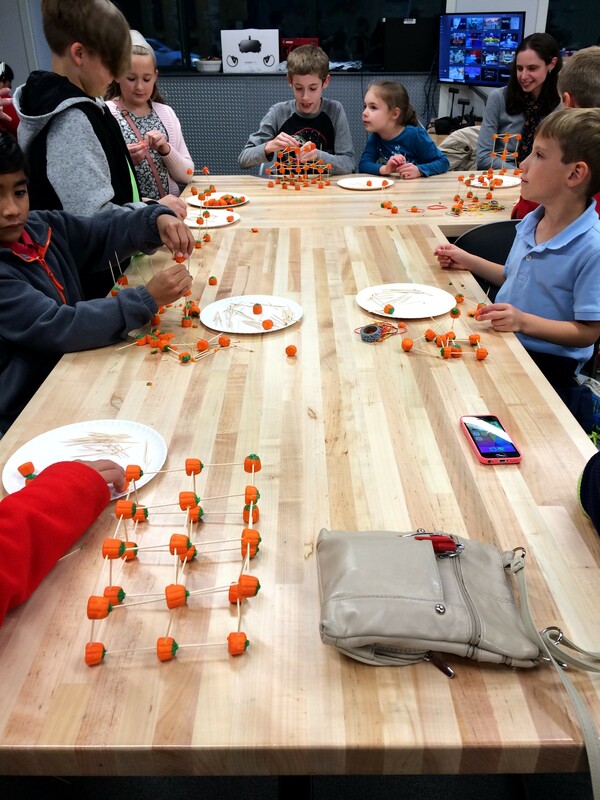 They were given approximately 15 minutes to engineer their pumpkin structures. 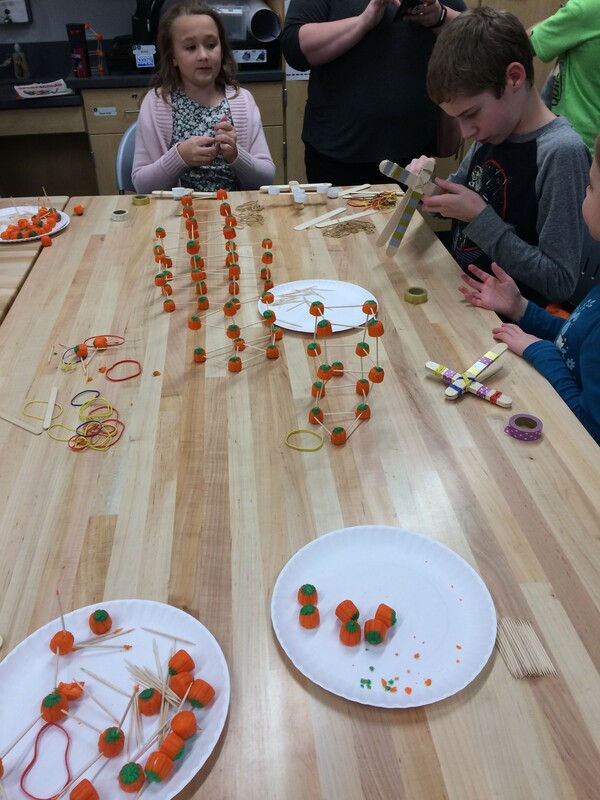 When time was up, everyone walked around to see the creations of their peers, then voted by show of hands on the “best” structure. 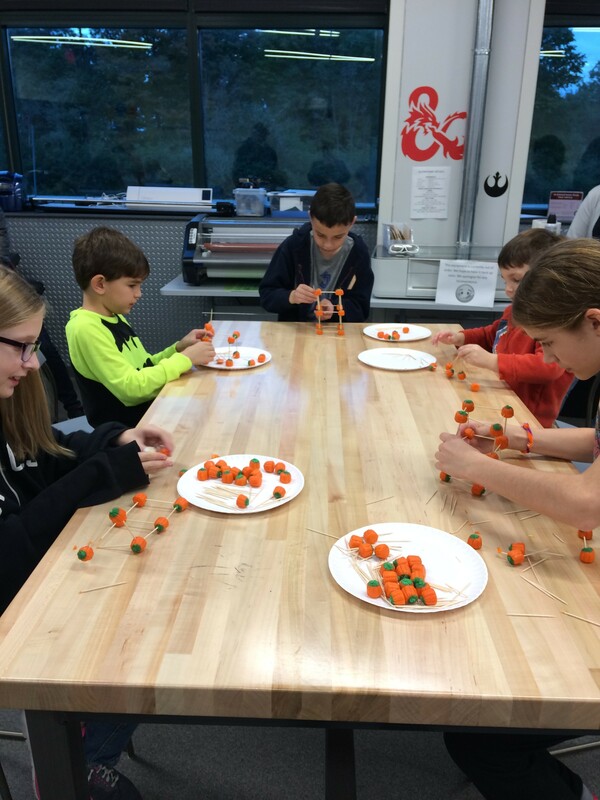 There were a number that got recognized; for highest number of levels, for largest “foot print” and for “most creative.” The prize was that everyone got to eat one more candy pumpkin. After the structure challenge was complete, it was time to build pumpkin catapults! 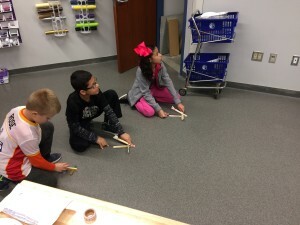 A quick demonstration of the basic principles to be used was given. 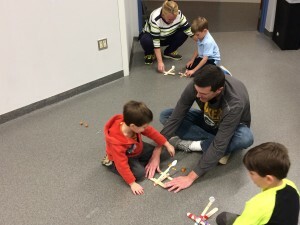 I showed a model catapult I had built from craft sticks, rubber bands, and a bottle lid. 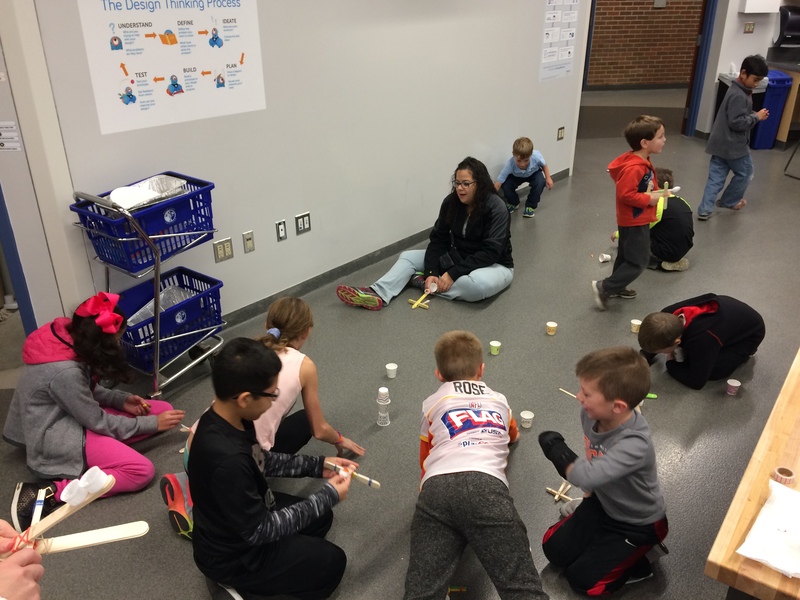 Supplies, including plastic spoons, multiple sizes of craft sticks, and rubber bands of varying sizes were made available, and everyone was given about 10 minutes to build their catapults. There were also bottle caps and hot glue available. The largest of the craft sticks I reserved for a surprise at the end of the program. When they had finished building their catapults, then the real fun began! 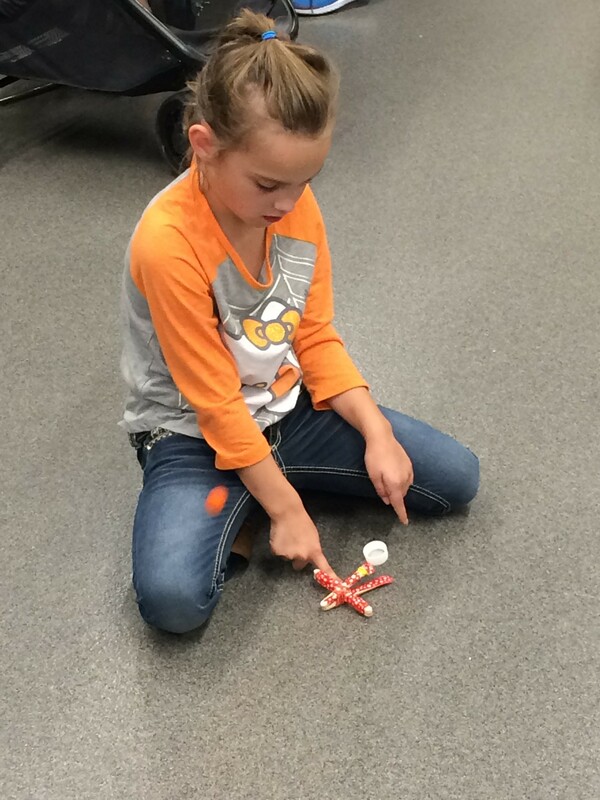 Using more candy pumpkins and some of the candy corn, they used their catapults to practice flinging pumpkins at each other, at stacks of paper cups, at the ceiling, across the room, etc. They had a blast and parents in the room were having just as much fun as the kids. They tried making modifications to their catapults, to see if it would change how they worked. They tried holding and firing them different ways. In the end it was a pumpkin-flinging good time! With a few minutes left of the program, I brought out a small pie pumpkin and asked if they thought we could create a catapult from the materials at hand that would be able to fling the “real” pumpkin. After building what we thought might do the job, we took it right outside the door to test fire. Unfortunately, the pumpkin was too heavy for our catapult, and not much of anything happened with it. But we had a lot of fun “betting” on the distance the pumpkin would fly! Everyone had so much fun with this particular program that I am considering rebooting it with valentine candy, Easter candy, and Fourth-of-July candy! More than a week after the program, an adult who had been involved stopped me as I walked through the library to ask if all the pumpkins had been cleaned up yet, and to tell me how much they had loved building with and flinging candy pumpkins around the room! Jennifer is a Children's Programmer at the Kenton County (KY) Public Library. She is also a Certified Professional Environmental Educator and holds a KY Early Care and Education Training Credential (EE Specialty.) She has been enjoying science and the environment her whole life, and has been sharing it with kids and families for 25+ years through her job, the Girl Scouts, and her home garden which is open to the public.